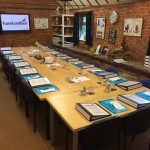 Why choose Hawksmoor Hydrotherapy Centre for your pet? Hydrotherapy is derived from the Greek word meaning water healing. It is controlled aquatic exercise in heated sanitized water. Any treatment in water. The encompassing warmth of the water will relax muscles by initiating an expansion of surface blood vessels and increasing the skin temperature which can bring about a decrease in pain and muscle spasm. A decreased range of motion can often be due to pain, swelling or stiffness. Stiffness can be eased as the warmth of the water causes blood vessels to expand. Hydrostatic pressure applied by the water can assist in reducing swelling by causing a bodily fluid movement away from the affected area instead of to it. This is increased with exercising the limb to enhance the circulation. Buoyancy decreases the loading onto weight bearing joints removes the impact associated with walking on dry land and provided assistance with balance. This helps to reduce pain and can allow easier movement with minimal exercise. The buoyancy of the water will help move the stiff joint with further range of movement with minimal exercise. Such as muscle building and toning, prior to surgery can be effective without further damage to affected joints etc., In certain cases the building up of muscle before surgery can reduce to dog’s rehabilitation time post surgery as well as make the process easier. For a multitude of conditions can be based around or greatly assisted by hydrotherapy. Common examples include cruciate repair, OCD, hip and elbow dysplasia, hip replacement, and general fixation. Treatment can also be beneficial in cases of CDRM, arthritis, spondylosis, nerve damage, muscle, tendon and ligament injuries. Obesity can be tackled in conjunction with your vets’s recommended diet. The non-weight bearing, non-impact nature of the work in the pool is more gentle to joints and muscles than land based exercise. Can greatly benefit from hydrotherapy treatments. Many dogs in this category start to lose general fitness and muscle tone, as well as put on weight, due to the decreased level of exercise that they can cope with. The non-weight bearing work in the pool, allows the dog to exercise it’s joints more easily, with less pain and through greater movement, therefore building general fitness and muscle tone. 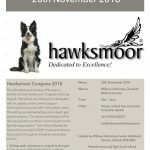 If you would like to know if your dog could benefit from hydrotherapy treatment, either speak with your veterinary surgeon or contact Hawksmoor. Hawksmoor insist on a Veterinary Referral letter prior to commencement of any treatment of any animals.